Spring is here and that brings warmer weather, budding flowers and basketballs flying for March Madness! Whether you watch the basketball games on your own or with a group, these snack recipes will take you all the way to the Final Four! You’ve joined the office pool for predictions and now it’s time to sit back and watch the jump shots fall where they may! March Madness is here and that means plenty of basketball on TV. Why not get some snacks together to enjoy the show? Check out some favorite SheKnows party recipes that score big! It doesn’t get any easier to toss together this great snack when you’re ready to enjoy the alley-oops and slam dunks! A batch of sweet chili popcorn to snack on is perfect to enjoy the show! Your friends will make a fast break for these chewy brownie drop cookies. Part brownie, part cookie, chewy brownie drop cookies are one of the best double-doubles you’ll witness! Forget about frozen pizza or time-consuming delivery, and go for some bracket-busting bruschetta or crostini instead. These are a breeze to make and you can either use your favorite toppings, or try roasted pepper and mozzarella bruschetta or a similar snack in goat cheese, marinara and pesto crostini. Grab a bag (or two) of tortilla chips to scoop up this tasty turkey chili dip. These are way better than arena nachos, and you won’t even have to wait in line! 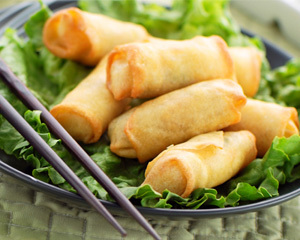 Classic Asian spring rolls are great to help satisfy appetites when you don’t have time for a sit-down dinner. 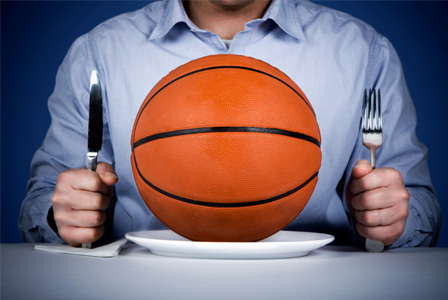 When game time rolls around and you need to make a fast break for food, make sure you have these on hand! A little pre-game prep and you’ll be ready for tipoff. 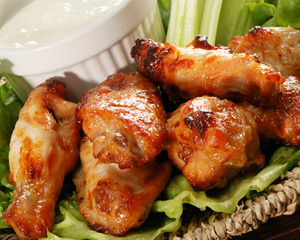 Baked marinated hot wings are super easy to make, and they’re baked, not fried — good to help keep you and your friends in top baller shape! Now that it’s time for the best of college hoops, make sure you’re ready to watch with plenty to snack on with these great party recipes!